I’m putting in a really valiant effort to improve my repertoire of edible (read: someone aside from me will eat and not gag on the finished product) meat-based dishes, so this week I tried my hand at chicken scaloppine. It was surprisingly easy, and required just a tiny bit of finesse and timing. Start with 4 chicken cutlets (thinly sliced chicken breasts) of about the same size. If you go to the meat counter they can hand pick them for you, but if you are buying them in a package you might want to buy two packages so you have a better chance of finding four that are similarly sized. As it was, the four I purchased were vastly different, which was fine, it just means you have to keep that in mind for cooking time. About an hour before you want to start cooking, take the chicken out of the fridge and put it on the counter to come to room temperature. 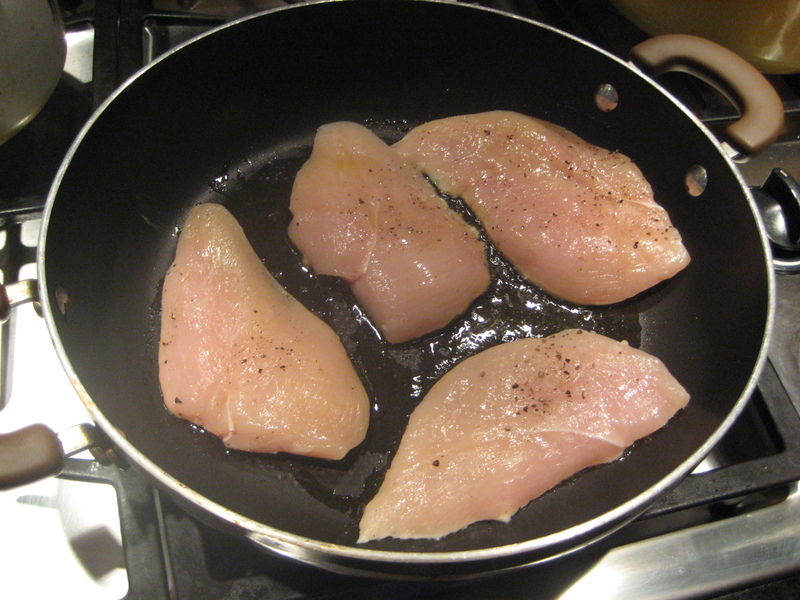 You don’t want to put cold chicken in a hot pan- it will stick to your pan and not cook as evenly. 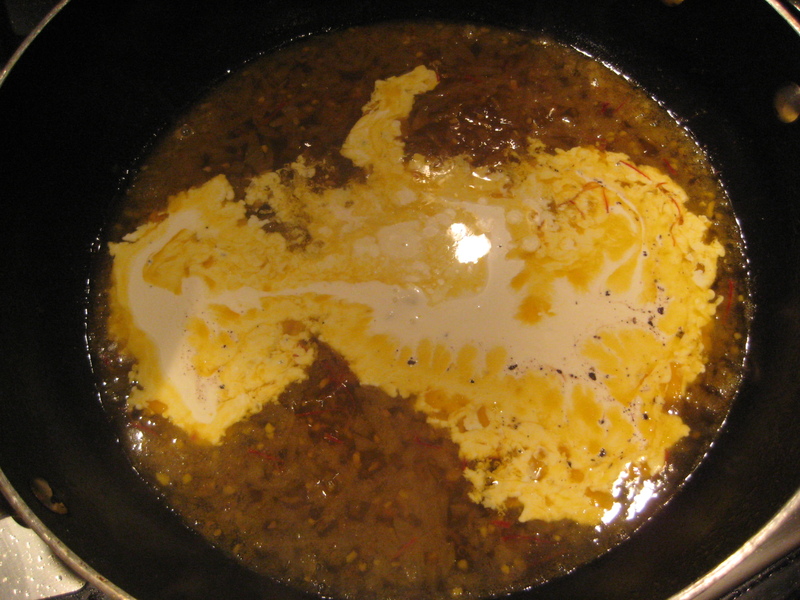 Using a large skillet, heat a few tablespoons of olive oil over medium heat. While it is heating, season the chicken (on both sides) with salt and pepper. Place the chicken in the pan, and cook for 2-3 minutes on each side (tongs are helpful here). If you have a particularly small piece of chicken, take it out sooner, if you have a larger piece, leave it in longer (duh). To test for done-ness you can take the professional route and tap it with your finger- it should feel like the pad of skin under your thumb. Or, you can use my method and cut into the thickest part of the biggest piece- its cheating but if you are careful you won’t totally mess up your piece of chicken. 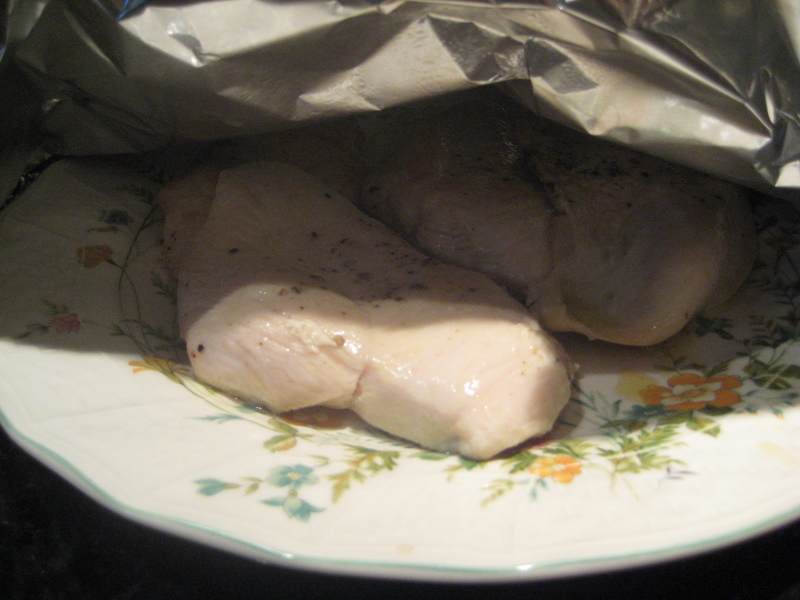 Once the chicken is done, place them on a plate and cover with tin foil to keep warm. In the same pan that you cooked the chicken, over medium-low heat, add two chopped shallots and one chopped clove of garlic, as well as ½ to 1/3 cup of white wine to deglaze. I used a Como Sur Sauvignon Blanc, because I was drinking it while I was cooking, anyway. Cook, stirring intermittently, until the wine is all but absorbed and evaporated. Add 1 and ¼ cups of chicken broth (you could also use vegetable broth if you prefer, or any kind of stock for that matter). At this stage you also want to add your primary flavor agent. Some options are saffron (which I used), lemon, tomato paste, or just a variety of herbs. If you use saffron, toss in ¼ teaspoon when you put in the chicken broth, wait until the mixture simmers, and then cook until the liquid reduces by half, 8-10 minutes. Then, add ½ cup heavy cream, plus salt and pepper to taste. 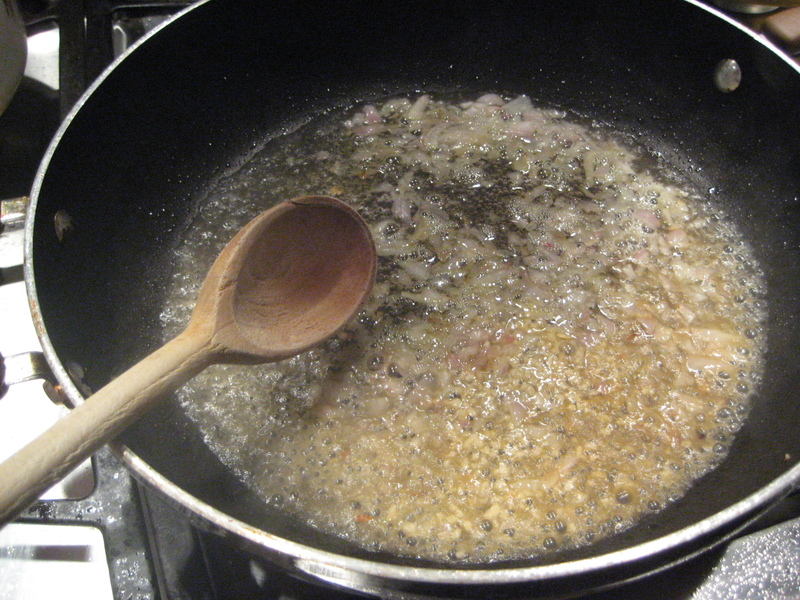 Stir together and cook over low heat for about 2 minutes, until the liquid has reduced again. While this is happening, quickly put your chicken on the serving plate you are going to use, or if you are using individual dishes, start plating them. There will be chicken drippings left on the plate the chicken was resting on- pour these into the pan with your sauce. Once your chicken is on the plate and the sauce is reduced to your liking, spoon it on top of your chicken, put the rest in a bowl with a spoon, and serve immediately. Voila! Since it is still technically summer, I served this with a cold butter bean salad, which made the whole meal a little lighter. You could easily make this a fall or winter meal by pairing it with potatoes or root vegetables. 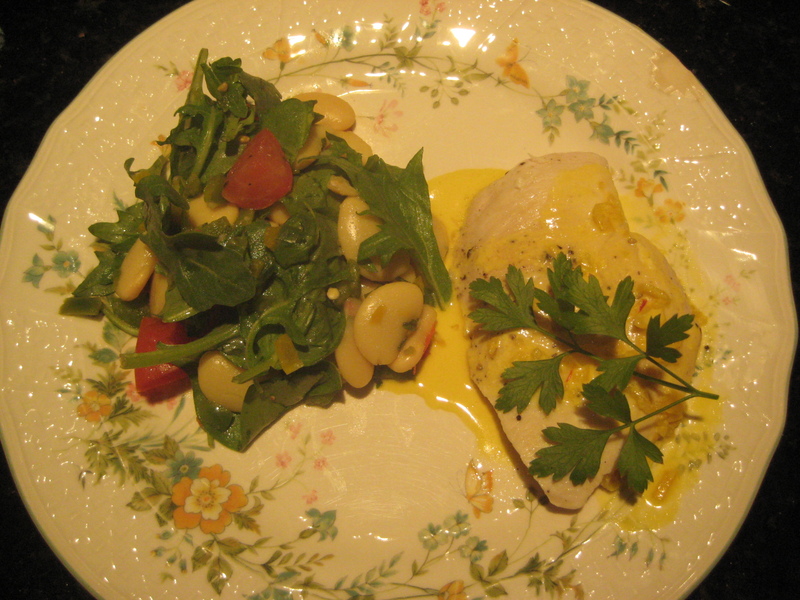 The recipe for the butter bean salad, inspired by my friend Cindy, is below. 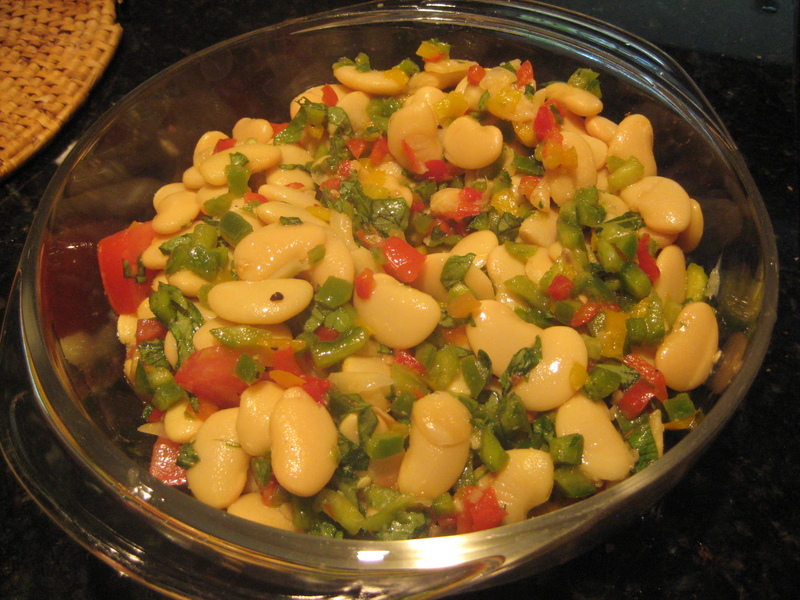 3 cans Butter Beans (also known as Gigandes) – if you have time to soak dried beans, go for it. Rinse and drain the beans, put into a large mixing bowl. Add olive oil, lemon juice and zest (it seems like a lot but it makes the canned beans taste really fresh), tomato, peppers, salt and pepper. Mix well. Refrigerate for at least 2 hours- this gives the flavors a chance to marry and marinate in the lemon juice. Just before serving, fold in the greens, then taste and adjust the salt/pepper seasoning if needed. Voila. Love your blog, discovered it through the Carmela Soprano lasagna recipe (excellent!). Slight modification to this recipe that I think really sounds it out: in place of the juice of one lemon, add sweet vinegar, white wine or even mirin to bring out the sweetness of the peppers. Otherwise, well done!